Due to the fact that most senior citizens prefer to spend their golden years in their own home, respecting these wishes can be hard when the risks are so real. Did you know that one out of every three adults age 65 or older will have a serious fall each year? In order for a senior to remain independent, they need a reliable device that can connect them with help quickly. Family members have peace of mind knowing their loved one is protected by a service that is both personable and attentive. Remember the old television commercial from Life Call that started with "I've fallen and I cannot get up?" That was groundbreaking technology for its day, but since that time, things have come a long way. The very core of their design though is still alive and well today. By simply pressing a button, help can be on its way. Using the exact same technology, the team at Reviews.com researched 69 medical alert services and found four contenders who can provide the best at-home care. They are Life Station, Bay Alarm Medical, Mobile Help, Acadian on Call, and Medical Guardian. Tests were conducted on each service provider using criteria, such as response rate, employees, and other features were measured. Some have great features that connect you straight with a 911 operator using a long-distance walkie-talkie. This allows an extra layer of security, especially for those who are out and about at night. The testing was thorough and the results uncanny. If this is your first time buying a unit of this type, you want to try to keep things simple. Seniors usually do not like a bunch of buttons and features that require their hands to work overtime. To come up with the best options for seniors, services had to have nationwide coverage. Any device that also required a full home security system, which was an additional cost, was also cut from the running. The purchasing process was important. Seniors want a simple product at a great price. Customer service is another big part of the puzzle. If a provider cannot respond to emails or phone calls, how can they monitor and take care of their customers? The team weeded through confusing terms and hidden fees to find the best for you. Life Station is a good company and they are one of the leading brands on the market. Their machines are landline based only. They do not have mobile-enabled devices, which is weird in our technologically advanced world. The reps will do everything they can to get you into limited promotional and try to upsell you to a higher priced unit. This company has good protection services, but the range is only 500 feet. This can be limiting even in a house where the square footage is larger. The do have reasonably priced units and they are dependable, so those who want something that is more standard without all the bells and whistles may look to them for assistance. They have been in business since 1977, and they offer their customers the freedom of no long term contracts. It is a $29.95 base fee with discounts available. You can cancel anytime, just as long as you provide a 30-day notice. Like other companies, there is no contract with Bay Alarm Medical. They have prices starting at just $25 a month for a high-quality device. Those who want extra services can add CO and Fire/Smoke protection for an additional cost. This company does not have an in-house monitoring system, however, they use call centers with knowledgeable reps. In fact, their customers service rivals those who have their own monitoring system. They have clear pricing, great video demonstrations on their site, and set up is simple. Though the machine does not have the best looks, it is sufficient and functional. It can be hooked to a mobile or landline for convenience. Mobile Help is probably one of the most technologically advanced companies for this type of service. They do not have their own monitoring services; rather, they piggyback onto Acadian's. They have great upgrade options and services like automatic fall detection. The buttons can be wall mounted for ease of use. They have a necklace and a watch option made to look just like jewelry for those who want their monitoring to be incognito. One drawback with this service is that they only use AT&T's cellular service, which can be difficult in some areas. They do not use a landline. The monthly monitoring cost is $39.95. When you have Florence Henderson as your spokesperson, you know you are a big hitter. The average response time to their customers is 49 seconds, which is pretty impressive by any standards. They do not have a free trial period like most, but they will lock you into a 90-day contract. They will give discounts to members who pay for their fees annually or quarterly. The company has only been around since 2005. They have great options that start at $29.95 a month or $89.95 billed on quarterly. Users can choose between a necklace pendant or a bracelet. Though they have mobile phone service, it works best with a land line. Acadian is one of the leaders in this industry, without a doubt. They have their own monitoring system, as well as being affiliated with a smoke alarm association. Their pricing is competitive and they give immediate attention to their customers. In most cases, you are likely to talk to an EMT or a nurse when you call. There is no requirement that requires them to have trained professional answering calls, but it just shows that they go above and beyond the call of service. Their plans start at just $29.95. Between 2012 and 2050, the population of seniors over 60 years of age is expected to double. It is estimated that more than 90 percent of that population will live in their own home. 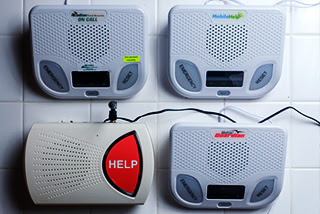 The medical alert industry is becoming more popular, as the need for their services is demanded. For some, having these devices is the difference between being in their own home or an assisted living facility. Call and get information before making a decision. Plans and offerings change frequently.